Oh, how the spirits moved them — in the early morning, as dawn emerged; or unexpectedly, demanding their full attention in deeply immersive, trance-like work sessions that could last for hours; or, to be sure, during hair-raising, table-rattling séances, in which contact was made with those who had long since “passed over to the other side”! The inspired, bedazzled, bewitched, or befuddled who, in different ways, claimed to have been moved or even guided by something outside themselves to make art are the subject of Duende, an intriguing, often sumptuous exhibition of these artists’ unexpected and inventive creations at Cavin-Morris Gallery in Chelsea, where it will remain on view through June 9. Taking its title from a word defined in the Royal Spanish Academy’s official dictionary of the Spanish language as a fantastic spirit that can cause disorder or tumult, or as a mysterious, ineffable kind of charm or allure, Duende features works in various media by more than a dozen artists. All of them fall into the overlapping art brut (literally “raw art,” a term coined in the 1940s by the French modern artist Jean Dubuffet) and outsider art genres — for those who want or need labels, that is. Cavin-Morris’s directors, Shari Cavin and Randall Morris, have long pursued their own research about the wide range of art forms, from contemporary ceramics to antique Japanese textiles, African carvings, and definitive examples of art brut, that has shaped their personal collection, while simultaneously informing the scope of their gallery’s programming. Similarly, they studiously amassed the works on view in Duende over an extended period of time, sometimes responding to tips from fellow researchers (like Terezie Zemánková, a granddaughter of the mediumistic artist Anna Zemánková, whose work the gallery has long represented). During her lifetime, the work of the German-born Agatha Wojciechowsky (1896?–1986) was sometimes recognized as Surrealist, but after she moved to the United States in the 1920s and settled in New York, she became known as a Spiritualist medium and healer. 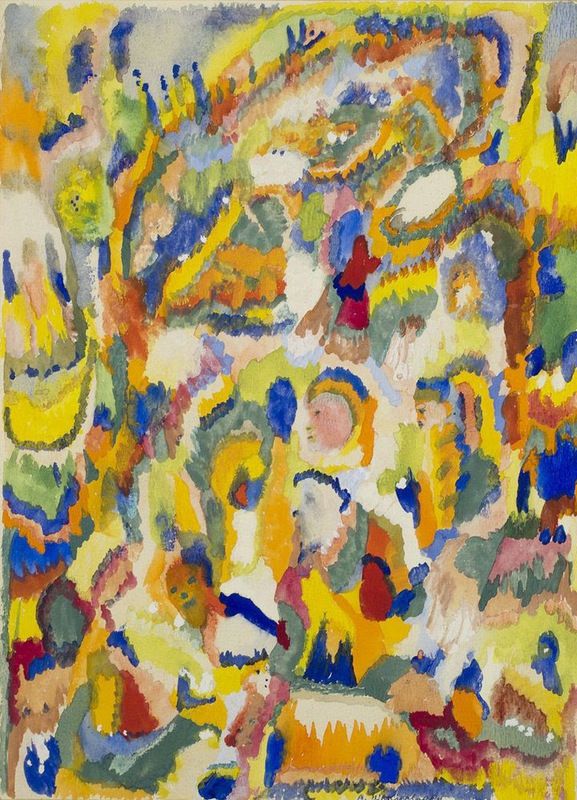 She once referred to her art as “the work of different entities who take over and step into my body, directing my hand,” adding, “I really have nothing to do with it.” Duende features two of Wojciechowsky’s watercolor-on-paper abstractions from the early 1960s, in which fleeting faces emerge out of dabbled patches of color in what seem to be overviews of richly textured landscapes. Surprisingly, for all its potentially goofy vibe, and despite its sometimes unabashed earnestness, the best of this kind of art transcends kitsch. After all, purist-believers would argue, this art is an expression, made tangible, of the will of higher powers. With their peculiar aura and strange charms, the allure of some of these works is hard to miss. Some viewers might dismiss the artists’ stories, but when it comes to resisting the works themselves, they might not stand a ghost of a chance. Duende continues at Cavin-Morris Gallery (210 Eleventh Avenue, Chelsea, Manhattan) through June 9, 2018. Alicia Gibson represents a new generation of women painters; unafraid and unapologetic about using their personal lives to speak freely about the complex realities of being a woman in 21st century America. Her post-feminist punk stance continues and updates the traditions found in the work of Joan Snyder, Nancy Spero and Tracey Emin, among others, and speaks in a similar voice as Lena Dunham and Amy Schumer. Using the language of abstract expressionist painting and collage, often adding an autobiographical scrawl, she combines biting humor and aggression with an unbridled honesty about female sexuality. Mandy Lyn Perez uses imagery of electronics, punk and ska posters, stained glass windows, and church architecture. She deconstructs the language of abstraction on hand-built, irregularly shaped wood panels; slathering on thick paint, bending it around the structures of her work, challenging the boundaries between painting and sculpture. Perez renews non-objective painting with fierce original beauty — sweet, violent, emotional, and filled with innuendo. Agatha Wojciechowsky was a well-known spiritual healer whose works of art were informed by her communication with the deceased. With no formal art education, she began making automatic drawings in the 1950s; first, letters of an indecipherable language, then boldly colored faces and figures in surrealist landscapes. Her work was featured in solo exhibitions in New York and Europe in the 1960s and 1970s, and in group shows with Dubuffet, Duchamp, Man Ray, Noguchi, and Picabia. Her work defies easy classification. By combining the use of a flat pictorial space and vivid color with figurative imagery, Wojciechowsky pre-dates and predicts much of today’s most contemporary and cutting edge painting. The artists in our exhibition share a wide-open emotional connection to their materials and subject matter that is not bound by any “school” of painting. Without regard for any pleasing or traditional sense of beauty, Gibson, Perez, Schwartz, and Wojciechowsky embrace and assault painting’s history, while building the language of its future. PURPLE STATES continues the investigation of the space between “insider” and “outsider” within a unique installation. PURPLE STATES is a term for states that are neither red nor blue and have begun to merge.